Adaptation refers to all approaches taken to adjust, prepare for, and accommodate new conditions that are created by changing climates. Adaptations may be cultural and societal, for instance families deciding to purchase flood, fire, or windstorm insurance. For natural-resource managers, adaptation strategies also include actions taken to assist natural resources (species, habitats, forest plantations, watersheds) in accommodating the changes and new conditions imposed by climate (Millar et al. 2008). In the context of climate change, mitigation is a human intervention or action designed to reduce and reverse the human influence on the climate system, primarily through increased removal of greenhouse gases from the atmosphere, the reduction of greenhouse gas emissions, and the reduction of feedbacks that might enhance warming (Millar et al. 2008). 1. One set of options promotes resistance to the effects of climate change and strives to improve the defenses of the forest against anticipated changes. 2. Resilience options accommodate gradual change, usually returning to a prior condition after disturbance. 3. Options for response intentionally accommodate change and enable ecosystems to adaptively respond and adjust to future conditions. Management actions for adaptation vary widely, which provides flexibility in tailoring actions tomeet specific management and conservation goals. Having a number of options available in the management "toolbox" can help managers use a combination of traditional management approaches and new practices to improve the ability of ecosystems to adapt to new and often uncertain conditions (Millar et al. 2007). In a forest management context, examples of mitigation actions can generally be placed into three categories: emissions avoidance, sequestration, and substitution. 1. Emissions avoidance focuses on maintaining existing carbon storage in trees by avoiding deforestation and reducing potential impacts from catastrophic disturbances, such as wildfire. 2. Enhancing sequestration encompasses actions such as afforestation (planting trees) and managing forests to increase the amount of carbon stored relative to 'business as usual'. Adaptation and mitigation strategies are often considered joint paths - they are optimally combined and integrated (Millar et al. 2008). For example, a fuel-reduction treatment to reduce severe wildfire could be conducted for complementary adaptation and mitigation goals: reducing wildfire protects certain habitats and also averts excess greenhouse gas emissions. However conflicts between adaptation and mitigation can also occur in forest and ecosystem management situations (Klein et al. 2007). Mitigation options may have negative ecological consequences, and adaptation options may have associated carbon effects; for this reason it is important to assess potential tradeoffs between the two approaches and try to seek strategies that may be complementary (Joyce et al. 2008). Forests and other ecosystems provide many direct and indirect services for humans and other species, including the provision of wood and fuel, food, temperature and flood regulation, erosion control, recreational and aesthetic value, and species habitat. These ecosystems are facing many cumulative threats due to climate change, which will affect how they function and whether they are able to provide these environmental benefits. Many ecosystems may be able to survive and adjust to climate changes on their own. However, this is unlikely to happen without severe near-term consequences for current ecosystem structure and the species that depend on this structure, including humans. In the past, plant and animal species have migrated and undergone genetic changes in response to climate change. These responses are now more difficult because of human alteration of the landscape and the rapid rate of climate change. For example, tree migration may not be able keep pace with the current and future rates of climate change (Mohan et al. 2009). Forests could convert to other ecosystems as tree species fail to survive and regenerate, or they could convert to forest types that are less economically, socially, or ecologically valuable than they were before. Actively assisting in adaptation to climate change may help to maintain the benefits society receives from ecosystems. By doing this, we could avoid future costs and risks that might arise from reacting to climate changes instead of considering them ahead of time (Joyce et al. 2008). Deciding NOT to actively manage an ecosystem is also an option, but one that should be reached after considering the vulnerabilities of an ecosystem and the variety of options available. A coherent adaptation strategy can help guide forests along a trajectory that will hopefully continue to provide the services that societies consider valuable. Current land-use patterns, including fragmentation, extensive urban and suburban development, altered fire regimes, vegetation management, and introduction of invasive species, often impede the ability of species to respond to climate change adaptively. Small population sizes and isolation of populations as a result of land-use impede gene flow; invasive species disrupt opportunities for migration; and altered fire regimes destroy corridors for movement and habitat for breeding (Joyce et al. 2008). Many land-use changes impose physical barriers that impede species' migration to favorable new environments (e.g. expanded suburban development). However some land-use patterns (e.g. roads, powerline rights-of-way) may assist migration for certain species that can tolerate these environments. Assisted migration is a management approach whereby resource managers physically move species (individuals, seeds, etc.) to new locations assessed suitable for survival under changed climate conditions. Assisted migration recognizes that suitable habitat will change as climate changes and that species need to move to survive. Under conditions of rapid climate change however, species may not be able to move fast enough on their own. Land-use changes further impede natural dispersal. For both of these reasons, intervention may be appropriate. Decisions on where to move species are based on projections about future conditions. For instance, species might be moved from current warm environments (e.g., lowlands) to higher elevations. Assisted migration is a controversial topic, as it assumes a secure understanding of local climate change and an understanding of biotic and ecologic responses and interactions (McLachlan et al. 2007). Carbon sequestration is the process by which carbon dioxide from the atmosphere is absorbed by trees and plants through photosynthesis, then stored as carbon in biomass such as tree boles, branches, roots, and foliage. Both live and dead plants (e.g., dead wood) contain carbon and are important for carbon sequestration. Significant amounts of carbon are stored belowground in plant roots and in soil. These various components are often referred to as carbon 'pools'. Forests in particular have a strong influence on atmospheric levels of carbon dioxide because trees are long-lived plants and contain significant amounts of biomass compared to other plants. The rate at which a forest can sequester carbon depends on many factors, including forest age; a young, fast-growing forest may sequester carbon more quickly than an old-growth forest dominated by mature trees. In contrast, an old-growth forest represents an immense amount of stored carbon that is being kept out of the atmosphere despite its slower sequestration rate. Carbon sequestered in trees and soils can be released back to the atmosphere through processes such as respiration, decomposition, and wildfire. Forests, as well as soils, oceans, and the atmosphere, have the ability to store carbon. A carbon sink occurs when carbon sequestration is greater than carbon release over a specified period. Carbon sources release more carbon than they absorb over a specified period. Forests can act as sources or sinks at different times. Forest management practices can affect both the total carbon storage and the rate of carbon sequestration in forest ecosystem. The effect of vegetation management on carbon sequestration is a complex issue and must be examined within a specific timeframe and include all components of the carbon life cycle. In general, certain actions, such as tree planting and keeping forest productivity high, can increase carbon sequestration. Thinning forests may delay large carbon dioxide emissions by reducing the chance of severe wildfire for a certain period of time, but will cause some emissions in the short-term. Other important forest management practices that may affect carbon sequestration include rotation length and fertilization; however, the effects of these activities are not well understood for all forest types. Management actions that promote increased sequestration may not necessarily be the same strategies that promote carbon storage; it is important to consider each of these within the context of other land management goals. For example, management activities that favor larger, older trees may favor the ongoing storage of carbon contained in those mature trees as opposed to an actual increase in the rate of carbon sequestered. Because goals and circumstances across ecosystems are so different, there is no single management solution to climate change. Meeting the diverse challenges that climate change is imposing on National Forests and other environments requires many approaches, and specific responses will depend heavily on the management goals for a particular resource. For this reason, adaptation options can be thought of as tools that are available in a well-supplied toolbox. Each option, or tool, will be selected based on the user's situation, goals, and needs. For example, some issues need to be addressed urgently whereas others are longer-term concerns-these require different tools and strategies for planning. In some cases quantitative planning and analytical models (climate and climate impacts models) need to be used. In other cases; conceptual processes (e.g., based on uncertainty) will be favored. Case studies and demonstrations will also become useful for considering alternative strategies. Collectively these strategies compose a toolbox from which the manager can choose the best approach to fit the situation at hand (Millar et al. 2007). This question remains largely unresolved; however, this is a huge area of interest in which new developments occur regularly. Most current information on the effects of climate change is available only for large spatial scales (e.g., global, regional, and subregional), and must be used cautiously when applied to smaller area, such as the forest and stand levels (Janowiak et al. 2011). In addition, uncertainty about future conditions increases at finer spatial scales, and this uncertainty must be considered in the management planning process. Addressing climate change can be easier to envision across large landscapes where more options for management, vegetation structure, and natural resource conditions exist. For individual projects, it will be critical to consider how small-scale activities contribute to much larger patterns of landscape diversity, habitat, and resilience to fire and other disturbances over decades to centuries (Joyce et al. 2008). Forest management planning can take deliberate steps to incorporate climate change. Management targets based on historical references (e.g., historical range of variation) and equilibrium conditions (e.g. plant association groups, potential natural vegetation), though traditionally used, will be less relevant as the climate changes. Management approaches and performance standards will need to be adjusted as change occurs (Millar et al. 2007). Planning is more likely to result in successful outcomes if it is consistently based on adaptive management; that is, management by experiment where resource monitoring provides feedback for decision making. Large disturbances and options for post-disturbance management should be included as a normal part of the planning process. Climate refers to the average meteorological conditions and patterns in a region over a long time period (classically 30 years according to the World Meteorological Organization). These meteorological conditions include measurements such as temperature, precipitation, and wind. generally consistent from year to year. The amount solar energy that reaches Earth. This is affected by changes in the Earth's orbit around the Sun and in the Sun's brightness. The chemical composition of the atmosphere. For example, changes in the amount of carbon dioxide and other greenhouse gases in the atmosphere affect how much energy (initially received as solar radiation) is trapped by the atmosphere. Energy that is not trapped is re-emitted into space. The reflectivity of Earth's surface and atmosphere. Surface features, such as ice sheets, increase the amount of solar radiation that is reflected back into space. These factors and ways that they interact with one another have all contributed to the climate patterns and variability we see in earth's history. However, the fact that climate has changed without human influence in the past does not mean that current climate change is following 'natural' patterns. The factor that best explains the observed global warming over the last century is the increase of CO2 and other greenhouse gases in the atmosphere, largely caused by the burning of fossil fuels and other human activity (IPCC 2013). 1. Ice cores - The ratio of oxygen isotopes in the ice can indicate the temperature at the time the ice was formed. Air bubbles trapped in ice can show what the greenhouse gas concentration of the atmosphere was at the time of formation. 2. Ocean sediment cores - The remains of small hard-shelled creatures (foramnifera) are preserved in ocean sediments. The composition of their shells can reveal ocean temperatures at the time of their formation. 3. Pollen records - Fossilized pollen grains can indicate what types of plants were present at the time the fossils were formed. 4. Tree rings - The width of annual tree rings in temperate climates depend in part on soil moisture and temperature, and can therefore reveal information about these variables. Past climate is often 'reconstructed' by looking at many of these measurements together. Humans are affecting the climate by increasing the amount of greenhouse gases present in the atmosphere and by changing the surface characteristics of the land (see discussion about "albedo"). Activities such as fossil fuel burning, land-use change (e.g. deforestation), animal husbandry, and practicing fertilizer-dependent agriculture lead to increases in greenhouse gases including carbon dioxide (CO2), methane (CH4), and nitrous oxide (N2O). These contribute to the greenhouse effect and cause the surface temperature of the Earth to increase. Global atmospheric concentrations of CO2, CH4 and N2O have increased markedly since 1750 as a result of human activities, and now far exceed pre- industrial values (IPCC 2007, WG1, Ch. 2). The greenhouse effect is the process by which certain gases in the atmosphere absorb and re-emit energy that would otherwise be lost into space (IPCC 2007, WG1, Ch. 1). The Earth's transparent atmosphere lets sunlight through to warm the ground and the oceans (more when it is clear, less when it is cloudy). The Earth's warmed surface releases some of that heat in the form of infrared radiation, a form of light, but invisible to human eyes. Greenhouse gases in the atmosphere like carbon dioxide (CO2), methane (CH4), nitrous oxide (N2O), and water vapor, absorb this infrared radiation and keep it from passing out into space. This energy is then reradiated in all directions, and the energy that is directed back toward the Earth's surface warms the planet. The greenhouse effect is necessary for human survival, since without it the Earth's average temperature would be about 0 C (Swanston et al. 2011). However current concentrations of greenhouse gases are higher now than they have been for the past 800,000 years encompassing the history of human development, and are enhancing the greenhouse effect. The 'greenhouse effect' gets its name from the fact that a fairly similar process takes place in a greenhouse. The glass panes on a greenhouse let incoming sunlight pass through them, but intercept some of the infrared light on its way back out, warming the interior (Climate Central 2009). The factor that best explains the warming trend over the last century is the increase of greenhouse gases in the atmosphere, which are caused by human activity. Scientists have examined many other potential causes of recent warming, such the Sun's variations in brightness, however, the magnitude of these effects is not sufficient to explain actual temperature observations on Earth. Human disruption is simply the only current explanation we have that fits the data (Lean 2009). Climate models are an important tool for studying all of the various influences on the Earth's climate. These models are constructed to include many different measurements that could affect temperature, including solar output, volcanic emissions, and the effects of greenhouse gas concentrations in the atmosphere. When the effects of increasing levels of greenhouse gases are included in the models, as well as natural external factors, the models produce good simulations of the warming that has occurred over the past century. The models fail to reproduce the observed warming when run using only natural factors (IPCC 2007). Global average temperatures are currently increasing at greater rates than those that have occurred over the last million years of Earth's history. Global average temperatures started rapidly rising during the 1900's as the industrial revolution was accelerating and as humans started relying more heavily on burning fossil fuels for energy (see Figure 4). For the past 100 years, we have clear records of the increasing rate of global temperature change. The decade beginning January 2000 and ending December 2009 was the warmest decade in the modern record (since 1880), with 2010 tied with 2005 as the warmest year on record (NASA 2011). From the 1910s to the 1940s, global average temperatures increased by 0.35 °C, and for an equivalent time period from the 1970s to 2006, global average temperatures increased by 0.55 °C (IPCC 2007), reflecting an increasing rate of change. The Earth's temperature has undergone some large changes in the past; according to proxy data, global average temperatures did change by as much as 4°C to 7°C between ice ages and warm interglacial periods. However, this change took approximately 5,000 years (IPCC 2007). Current rapid rates of global climate change are clearly very unusual in the context of past changes. More abrupt shifts may have occurred in the past at smaller, regional scales due to ocean heat transport, but did not likely affect the global mean temperature (IPCC 2007). Are Temperatures on Earth Changing? Is the Current Climate Change Unusual Compared to Earlier Changes in Earth's History? How is Today's Warming Different from the Past? Albedo is the reflectance of a surface, such as the earth's surface. Different earth land covers have very different albedo; for example, ice and snow are highly reflective (high albedo) while darker surfaces like vegetation do not reflect as much radiation (low albedo). Albedo plays an important role in global temperature change, since absorbed solar radiation warms the Earth's surface, whereas reflected radiation does not. Feedback is a general term that encompasses all of the different forms of energy exchange between the land surface and the atmosphere. In the context of global warming, positive feedbacks enhance land surface warming; negative feedbacks enhance land surface cooling. Albedo is one component of this energy feedback. Since different land covers have varied albedo, land use change can influence albedo and whether a land surface has a warming or cooling effect. As mentioned, snow has a very high albedo because it reflects more sunlight, and thus has a cooling effect on global temperatures (negative feedback). However, if snow melts and is replaced by darker vegetation, more sunlight is absorbed, which will add to a warming effect (positive feedback - IPCC 2007). An emerging topic of interest related to albedo and feedback is the deposition of black carbon. Black carbon is a component of air pollution and is produced by combustion. It absorbs solar radiation and can greatly lower surface albedo if deposited on snow or ice. Black carbon is now thought to have played a major role in warming in the arctic, mainly by changing albedo and causing a positive warming feedback (Shindell & Faluvegi, 2009). How Much More Will Earth Warm? Global average surface temperatures have increased by about 0.74°C (1.33°F) between 1906 and 2005 (IPCC 2007), although the rate and magnitude of change differs with location and the period examined. While 0.74°C may not seem like a large temperature change, on a global scale this has huge implications for many of the earth's processes that effect ecosystems and humans. Even with this relatively modest temperature change, clear effects have been observed. 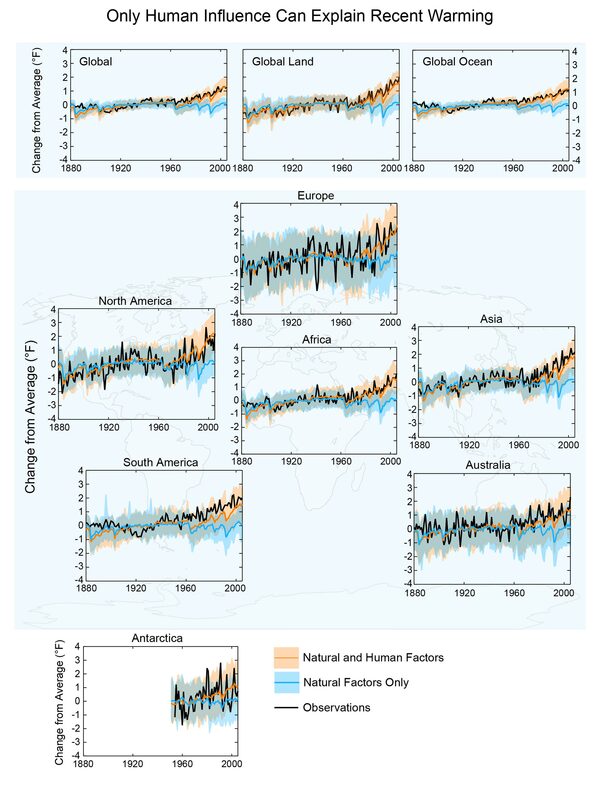 For example, in concurrence with observed temperature changes, in the 20th century there has been a nearly worldwide reduction in glacial mass and extent, a decrease in snow cover in many Northern Hemisphere regions, a decrease in Arctic sea ice thickness and extent, a decrease in the length of river and lake ice seasons, warmer ocean temperatures, and rising sea levels (IPCC 2007). From 1900 to 2005, long-term changes in precipitation trends have also been observed, leading to wetter conditions in some areas (eastern North and South America, northern Europe, northern and central Asia) and drier in others (the Sahel, southern Africa, the Mediterranean, southern Asia). Widespread increases in heavy precipitation events have been observed, even in places where total precipitation amounts have decreased (IPCC 2007). See the 'Ecosystem Effects' section of the FAQ's to read more about the implications of these changes. How are temperatures on earth changing? Is the amount of snow and ice on earth decreasing? Average global surface temperatures are projected to increase by 1.1 to 6.4°C (2 to 11.5°F) by the end of the 21st century, relative to 1980-1990, with a best estimate of 1.8 to 4.0°C (3.2 to 7.2°F) (IPCC 2007). This large range in projections is due in part to the fact that we do not know whether greenhouse gas emissions will continue at their current levels, increase, or decrease. Temperature projections do vary regionally, with the highest projected warming taking place near the poles (USGCRP 2009). These temperature changes will continue to have effects on ice extent, snow cover, sea level, and many other factors. See the 'Ecosystem Effects' section of the FAQs for more detail. Precipitation changes over the next century are more complex and uncertain, and differ within regions and subregions. Current models indicate that precipitation will generally increase in higher latitudes and in the tropical Pacific during the monsoon (rainy) seasons, and decrease in the subtropical dry belt. In the U.S. the Southwest is expected to become drier while northern regions may see an increase in precipitation (USGCRP 2009). Overall, the frequency and intensity of extreme weather events, such as heat waves, droughts, storms, heavy downpours, and heavy snowfall are projected to increase. Do Projected Changes in Climate Vary from Region to Region? Changing climates affect the water cycle by influencing factors such as surface temperatures & evapotranspiration rates, precipitation patterns, proportions of precipitation received as rain versus snow, and amount and timing of runoff. Increased temperatures lead to more precipitation falling as rain rather than snow, earlier snowmelt and snowmelt-driven streamflow, and reduced spring snowpack. For the mountainous regions of the Western United States, snowmelt provides approximately 70 percent of annual streamflow. Thus, reduced spring snowpack leads to reduced summer streamflow in these regions. (Mote 2003, Mote et al. 2005, Mote et al. 2008, Stewart et al. 2005). Precipitation patterns are expected to change in ways that are very regionally specific. In the United States, overall precipitation is projected to increase in the north and decrease in the south, while the number of heavy downpours is expected to increase everywhere (USGCRP 2009). In parts of the Midwestern and eastern U.S., earlier snowmelt combined with changing precipitation patterns is expected to produce increased spring flooding and lower summer water levels in rivers, lakes and wetlands (USGCRP 2009). Both Floods and droughts are likely to become more common and more intense as regional and seasonal precipitation patterns change, and rainfall becomes more concentrated into heavy downpours (with longer, hotter dry periods in between) (USGCRP 2009). Changing precipitation patterns, warmer temperatures and higher rates of evapotranspiration are expected in areas such as the Southwestern United States, and will likely lead to increased drought frequency and severity. Overall, the range and extent of drought-affected areas are projected to increase. In addition, an increase in the total frequency of heavy precipitation events is expected to cause more flooding in many areas. Earlier snowmelt and runoff due to warmer temperatures could also lead to increased winter and spring flooding (IPCC 2007, USGCRP 2009). Seasonal temperatures, storms and high winds, and precipitation events may become more extreme and variable than they have been in the past (USGCRP 2009). This could have consequences for species and ecosystems that are not able to recover from the level or frequency of extreme events. Are Extreme Events, Like Heat Waves, Droughts or Floods, Expected to Change as the Earth's Climate Changes? Climate Change Impacts by Sector - Water Resources Sector. Warmer and drier spring and summer conditions are currently associated with more numerous fires, greater fire extent, and a longer fire season especially in the Western United States. Warmer spring and summer conditions lead to relatively early snowmelt, lower summer soil and fuel moisture, and thus longer fire seasons; in some areas, the window of time for high fire risk is expected to increase by 10-30% (McKenzie et al. 2011). Increased fire frequency and severity are more difficult to predict, but the interaction of higher temperatures and drier fuels could potentially produce these outcomes. In general, we can expect more large and severe fires at broad scales. (Heyerdahl et al. 2008, McKenzie et al. 2004, Taylor et al. 2008, Westerling et al. 2006). Climate is a major determinant of ecosystem structure and processes such as species distribution and abundance, regeneration, vegetation productivity and growth, the timing of biological events (phenology), and disturbances (e.g. insects and fire). With climate change, increasing temperatures and changes in precipitation will impact both ecosystem structure and ecosystem processes. For example, regeneration of tree species will be influenced by changes in snowpack, length of growing season, and moisture availability. This effect could be positive for some species, negative for others. Species distributions are likely to shift and ranges may expand for some species and contract for others. Plant and wildlife reproduction will be affected by changes in the timing of flowering, pollinating and breeding events (Parmesan, 2006). Insects and disease outbreaks may become more frequent and widespread because warmer temperatures may accelerate their life cycles (Logan and Powell 2001). Fire extent and frequency will likely increase with higher temperatures and longer fire seasons (McKenzie et al. 2004, Westerling et al. 2006). Increased disturbances may create opportunities for invasive species to become established, and invasive species may also show positive response to increased carbon dioxide levels. In addition to these disruptive effects, forest productivity may increase in some areas due to higher levels of CO2 (CO2 fertilization) as long as water remains available. The duration of the CO2 fertilization effect on ecosystems is not well known; it's effect on individual trees is short-term, since trees acclimatize to CO2 levels over time. For more details on how climate change will affect specific ecosystem components, see the CCRC collection of Topic Pages. Plant and animal species responded to historical climate variability through shifts in geographic range (migration). Evolution, made possible through genetic diversity, also helped species become more adapted to new climates over many generations. Genetic mechanisms that have allowed species to adapt to historical climate changes include mutation, natural selection, changes in gene flow and breeding patterns, and genetic drift (that is, random effects resulting from changes in population size, isolation, and fragmentation). Over time, species survived where genetic changes resulted in increased adaptation to new climate conditions; others suffered loss of fitness, population extirpation (loss of a population but not entire species), and species extinction. The unprecedented rates of climate changes occurring now, combined with habitat fragmentation and land use changes that impede gene flow, pose serious problems for the ability of plants and animals to respond to current climate changes as they have in the past, through evolution and migration (Davis and Shaw 2001). Hundreds of studies in the U.S. have already documented species responses to climate change, including changes in phenology (the timing of cyclical changes), range shifts, local extirpations and even some genetic response. Climate change has altered the phenology of plant and animal species on nearly every continent, meaning that the timing of regular annual species events has changed due to longer and/or earlier growing and breeding seasons. Documented examples include earlier dates observed for plant flowering and bud break, animal emergence from hibernation, breeding, and egg laying for certain species (Parmesan 2006, Cayan 2001). In some cases, changes in phenology lead to a mismatch between species that interact with or depend on one another. For example, in Colorado, marmots have been emerging earlier from hibernation most likely in response to increased air temperatures, but without a corresponding emergence of flowering plants that the marmots need as food (Inouye 2000). 2006). This has been accompanied by extirpations (local population extinctions) for some species that are dependent on cooler climates, for example pika populations in the mountainous western U.S. (Beever et. Al. 2003). Although often difficult to separate from other factors, some evolutionary responses to climate change have been documented. These have principally occurred in fast-reproducing insect species, however there is little evidence that genetic shifts will be of the magnitude necessary to avoid extinctions (Parmesan 2006). For more details on how climate change is affecting specific ecosystem components, see the CCRC collection of Topic Pages. It is well understood that changes in climate will affect vegetation productivity and distribution (Ryan et al. 2008). However, site-specific vegetation responses to current climate change are extremely complex and difficult to forecast. Responses will depend primarily on factors that limit plant growth at a particular site, namely temperature and precipitation. Temperature: With increasing temperatures, species that are limited to lower latitudes or elevations may expand their ranges northward or upward in elevation. In turn, species that are dependent on colder temperatures (e.g. alpine vegetation) may decline or be out-competed. Warmer winters, earlier spring snowmelt, and changing freeze-thaw patterns could each have negative effects on certain plant species. However, increased temperatures can result in longer growing seasons, which have been associated with increased annual productivity. Increases in forest primary productivity can occur with higher temperatures, however this is highly dependent on the availability of water during the proper time in a tree's growing cycle (USGCRP 2009). Disturbances: Disturbances to vegetation and forested ecosystems are expected to increase with climate change. Warmer and drier conditions could lead to increased incidence and severity of wildfire in some areas. Warmer winters can also allow the spread of damaging insect pests (e.g. the bark beetle) that were previously kept in check by consistent cold winter temperatures. An increase in severe weather events would also have strong implications for vegetation distribution and productivity. Beever, E.A. ; Brussard, P.F. ; Berger, J. 2003. Patterns of apparent extirpation among isolated populations of pikas (Ochotona princeps) in the Great Basin [pdf]. Journal of Mammalogy. 84: 37-54. Cayan, D.R. ; Kammerdiener, S.A.; Dettinger, M.D. ; Caprio, J.M. ; Peterson, D.H. 2001. Changes in the onset of spring in the western United States. Bulletin of the American Meteorological Society. 82: 399-415. Chapin, F.S. ; Matson, P.A. ; Mooney, H.A. 2002. Principles of terrestrial ecosystem ecology. New York: Springer-Verlag. 436 p.
Crozier, L. 2004. Warmer winters drive butterfly range expansion by increasing survivorship. Ecology. 85: 231-41. Davis, M.G. ; Shaw, R.G. 2001. Range shifts and adaptive responses to Quaternary climate change. Science. 292(5517): 673-679. Delcourt, H.R. ; Delcourt, P.A.,(eds.). 1991. Quaternary ecology: a paleoecological perspective. New York: Chapman and Hall. 252 p.
Heyerdahl, E.K. ; McKenzie, D.; Daniels, L.; Hessl, A.E. ; Littell, J.S. ; Mantua, N.J. 2008. Climate drivers of regionally synchronous fires in the inland Northwest (1651-1900). International Journal of Wildland Fire. 2008(17): 40-49. Inouye, D.W.; Barr, B.; Armitage, K.B. ; Inouye, B.D. 2000. Climate change is affecting altitudinal migrants and hibernating species. Proceedings of the National Academy of Sciences. 97: 1630-33. IPCC, 2007a: Climate Change 2007: The Physical Science Basis. Contribution of Working Group I to the Fourth Assessment Report of the Intergovernmental Panel on Climate Change [Solomon, S.; Qin, D.; Manning, M.; Chen, Z.; Marquis, M.; Averyt, K.B. ; Tignor, M.; Miller, H.L. (eds.)]. Cambridge University Press, Cambridge, United Kingdom and New York, NY, USA. Janowiak, M.K. ; Swanston, C.W. ; Nagel, L.M. ; Palik, B.J. ; Twery, M.J.; Bradford, J.B.; Webster, C.R. ; Parker, L.R. ; Hille, A.T.; Johnson, S.M. 2011. Silvicultural Decision Making in an Uncertain Climate Future: A Workshop-based Exploration of Considerations, Strategies, and Approaches. GTR NRS-81. Newtown Square, PA: U.S. Department of Agriculture, Forest Service, Northern Research Station. 14 p.
Joyce, L.; Blate, G.M. ; Littell, J.S. ; McNulty, S.G.; Millar, C.I. ; Moser, S.C.; Neilson, R.P. ; O'Halloran, K.; Peterson. D.L. 2008. National forests (Chapter 3). In: Synthesis and assessment product 4.4, adaptation options for climate-sensitive ecosystems and resources. Washington, DC: U.S. Climate Change Science Program and the Subcommittee on Global Change Research. Klein, R.J.T. ; Huq, S.; Denton F.; Downing, T.E. ; Richels, R.G. ; Robinson, J.B.; Toth, F.L. 2007. Inter-relationships between adaptation and mitigation. Climate change 2007: impacts, adaptation and vulnerability. Contribution of Working Group II to the fourth assessment report of the Intergovernmental Panel on Climate Change. In: Parry, M.L. ; Canziani, O.F. ; Palutikof, J.P.; van der Linden, P.J. ; Hanson, C.E., eds. Cambridge, UK: Cambridge University Press: 745-777. Lean, J. 2010. Cycles and trends in solar irradiance and climate. Wiley Interdisciplinary Reviews: Climate Change. 1: 111-122. Logan, J.A. ; Powell, J.A. 2001. Ghost forests, global warming, and the mountain pine beetle (Coleoptera: Scolytidae) [pdf]. American Entomologist. 47: 160-172. Maness, T.C. 2009. Forest Management and Climate Change Mitigation: Good Policy Requires Careful Thought. Journal of Forestry. 107:119-124. McKenzie, D.H.; Gedalof, Z.; Peterson, D.L. ; Mote, P. 2004. Climatic change, wildfire, and conservation. Conservation Biology. 18: 890-902. McKenzie, D.; Heinsch, F.A. ; Heilman, W.E. 2011. Wildland Fire and Climate Change. U.S. Department of Agriculture, Forest Service, Climate Change Resource Center. McLachlan, J.S. ; Heilmann, J.; Schwartz, M. 2007. A framework for debate of assisted migration in an era of climate change. Conservation Biology. 21: 297-302. Millar, C.I. ; Stephenson, N.L. ; Stephens, S.L. 2007. Climate change and forests of the future: managing in the face of uncertainty. Ecological Applications. 17: 2145-2151. Millar, C.I. ; Stephenson, N.L. ; Stephens, S.L. 2008. Re-Framing Forest and Resource Management Strategies for a Climate Change Context. Mohan, J.E. ; Cox, R.M. ; Iverson, L.R. 2009. Composition and carbon dynamics of forests in northeastern North America in a future, warmer world. Canadian Journal of Forest Research. 39: 213-230. Mote, P.W. 2003. Trends in snow water equivalent in the Pacific Northwest and their climatic causes [pdf]. Geophysical Research Letters. 30: 1601. Mote, P.W. ; Hamlet, A.F. ; Clark, M.; Lettenmaier, D.P. 2005. Declining mountain snowpack in western North America [pdf]. Bulletin of the American Meteorological Society. 86: 39-49. Mote, P.; Hamlet, A.; Salathe, E. 2008. Has spring snowpack declined in the Washington Cascades? Hydrology and Earth System Sciences. 12: 193-206. NASA - Goddard Institute for Space Studies. 2011. NASA Research Finds 2010 Tied for Warmest Year on Record. Research News. http://www.giss.nasa.gov/research/news/20110112/. (Accessed 12-8-2011). Parmesan, C. 2006. Ecological and Evolutionary Responses to Recent Climate Change. The Annual Review of Ecology, Evolution, and Systematics. 37: 637-669. Rodenhouse, N.L. ; Christenson, L.M. ; Parry, D.; Green, L.G. 2009. Climate change effects on native fauna of northeastern forests. Canadian Journal of Forest Resources. 39: 249-263. Ryan, M.G. ; Archer, S.R. ; Birdsey, R.A.; Dahm, C.N. ; Heath, L.S. ; Hicke, J.A. ; Hollinger, D.Y. ; Huxman, T.E. ; Okin, G.S. ; Oren, R.; Randerson, J.T. ; Schlesinger, W.H. 2008. Land Resources (Chapter 3) In: Synthesis and assessment product 4.3, the effects of climate change on agriculture, land resources, water resources, and biodiversity in the United States. Washington, DC: U.S. Climate Change Science Program and the Subcommittee on Global Change Research. Stewart, I.T. ; Cayan, D.R. ; Dettinger, M.D. 2005. Changes toward earlier streamflow timing across western North America [pdf]. Journal of Climatology. 18: 1136- 1155. Swanston, C.; Janowiak, M.; Iverson, L.; Parker, L.; Mladenoff, D.; Brandt, L.; Butler, P.; St. Pierre, M.; Prasad, A.; Matthews, S.; Peters, M.; Higgins, D.; Dorland, A. 2011. Ecosystem vulnerability assessment and synthesis: a report from the Climate Change Response Framework Project in northern Wisconsin. Gen. Tech. Rep. NRS-82. Newtown Square, PA: U.S. Department of Agriculture, Forest Service, Northern Research Station. 142 p.
Taylor, A.H.; Trouet, V.; Skinner, C.N. 2008. Climatic influences on fire regimes in montane forests of the southern Cascades, California, USA. International Journal of Wildland Fire. 2008(17): 60-71. United States Global Change Research Program (USGCRP). 2009. Global Climate Change Impacts in the United States. Karl, T.R. ; Melillo, J.M. ; Peterson, T.C. (eds). Cambridge University Press. Westerling, A.L. ; Hidalgo, H.G. ; Cayan, D.R. ; Swetnam, T.W. 2006. Warming and earlier spring increase Western United States forest wildfire activity. Science. 313: 940-943. Woodall, C.W. ; Oswalt, C.M. ; Westfall, J.A. ; Perry, C.H. ; Nelson, M.D. ; Finley, A.O. 2009. An indicator of tree migration in forests of the eastern United States. Forest Ecology and Management. 257: 1434-1444.